Kwicksilver now offers FULL SERVICE in house powder coating. With an appointment, drop off your car in the morning and pick it up in 3 business days with newly powder coated wheels. We remove the wheel/tire assembly from your car, dismount the tire, remove the tire pressure sensor (if so equipped), strip the existing finish down to the bare metal, repair any remaining curb rash, media blast, clean, apply the powder, cure the powder in an oven, replace the tire pressure sensor, re-mount and balance the tire, and finally replace the tire/wheel assembly back onto your vehicle torqueing the lug nuts to the factory specification. Powder Coating wheels and rims is extremely durable and long-lasting. We stock black in low and high gloss, as well as standard silver. 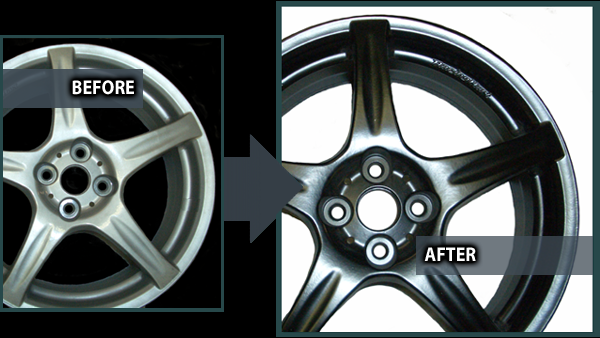 We are the only wheel repair shop in Sacramento, Placer, El Dorado, and Yuba Counties that powder coats in house. Everyone else subcontracts to a third party.